We appreciate hearing from our growing community, and while compliments always make us smile, we’re just as interested in suggestions and feedback to help us improve. Please contact us to share your experience with our studio! “New Attitudes has, and will always, be a cherished and important part of our lives. My daughter started dancing as a little girl. As the years passed the desire to compete was the ultimate goal. That competition goal was finally attained bringing many years of solo competitions and workshops. In addition to advancing in my daughter’s personal dance, she was honored to become a teacher at the studio. She was challenged in many different ways becoming a leader and mentor. “Seventeen years ago I enrolled my 3-year-old daughter in dance classes at New Attitudes Dance Studios. She was young and cute and looked forward to wearing a tutu, but I truly just thought that this was something for her to “try” on her path to discovering her interests and passions. Little did I know that this one registration would lead to a life-altering passion for not only my oldest daughter, but her two younger sisters as well. 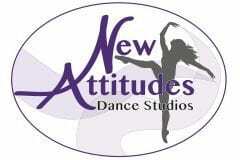 New Attitudes is not just a place for my girls to attend dance, but it’s their second home. It is a place where they can learn and grow and express themselves like no place other, and Janna isn’t just their dance teacher. She is their leader, their mother, their confidante, their friend, and their idol. What started 17 years ago as one little tap & jazz class has blossomed into 13 hours per week (per daughter) of jazz, tap, competition, lyrical, ballet, modern, pointe, performance, hip hop, and break dancing classes. What started as something to “try” has become something my girls cannot live without. I can honestly say that my girls would not be even a fraction of who they are today without Janna and the New Attitudes Dance Studios, and for that, I am eternally grateful! “I started dancing at New Attitudes Dance Studio when I was 5, and continued until I graduated high school. I loved it so much that I wish I could have picked up the studio and moved it to college with me! New Attitudes was, and always will be, a second home to me. Janna, the other teachers, and all the students become family. You meet friends from different schools or grades, and although you may only see them once or twice a week, they become lifelong friends. In addition to being surrounded by amazing people, being a dancer at New Attitudes is more than learning technique and memorizing a routine. You learn how to be comfortable with your body, how to express feelings with movement, and most importantly, you learn to have fun.